When customers check out with Easy Digital Downloads, WP Fusion will automatically save their customer data to your CRM as a contact. You can also optionally specify tags to be applied when a download is purchased, allowing you to unlock content on your site or trigger followup sequences and other automations in your CRM. 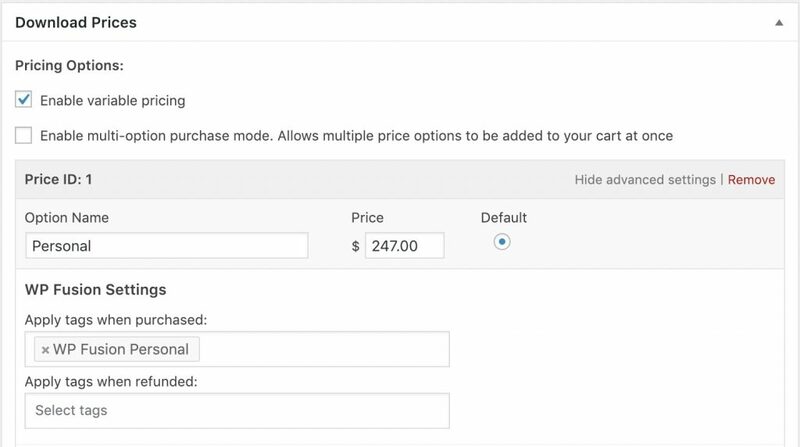 You can also configure tags to be applied at purchase (or after a refund) for pricing variations. If variable pricing is enabled, you can click “Show Advanced Settings” on any price to configure the WP Fusion settings for that variation.